"This perfect summer twist on a barbeque favorite will make you feel like you are beach side. Serve with fried yuca and a mojito for a tropical flair." Combine the beef, 1/2 cup coconut, cilantro, egg, lime juice, Worcestershire sauce, 1 tablespoon cream of coconut, soy sauce, and 1 1/2 teaspoons salt in a bowl until well mixed. Form into 4 patties, and set aside. Stir together the mayonnaise with 2 teaspoons of cream of coconut and 1 tablespoon of cilantro; set aside. Heat the vegetable oil in a skillet over medium heat. Stir in 1 cup of coconut and 1/2 teaspoon salt. Cook and stir until the coconut has turned golden brown. Drain on a paper towel-lined plate and set aside. Cook the burgers on the preheated grill to your desired degree of doneness, about 4 minutes per side for medium-well. Spread both cut sides of the hamburger buns with the cilantro mayonnaise. 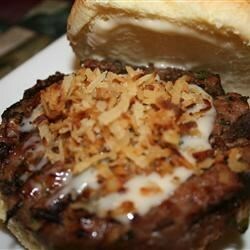 Place the cooked burgers on the bottom buns, sprinkle with the toasted coconut, and serve. My favorite recipe so far on Allrecipes. I love coconut so this was delicious!! I definitely recommend the hawaiian bread, I made little sliders with the rolls. yummy! i love the crunchy sweet and salty coconut topping. I used fat free mayo for the cilanto-coconut spread. I did use the egg but I don't think it was needed. Definitely try this!